Through our twitter feed @GVHeritage we capture a lot of interesting and useful information. Here is a recent selection. From the Natural Resources Defense Council we have an excellent piece extolling the virtues of reusing and recycling older buildings. They quote architect Carl Elefante, who coined the wonderful phrase, “the greenest building is one that is already built,” because you don’t have to use environmental resources in constructing its replacement. Urban Studies has an interactive map of fruit trees in Vancouver, including Grandview. And for the hands-on amongst us, the Old House Web has a useful guide to preserving ornamental decoration in heritage houses. 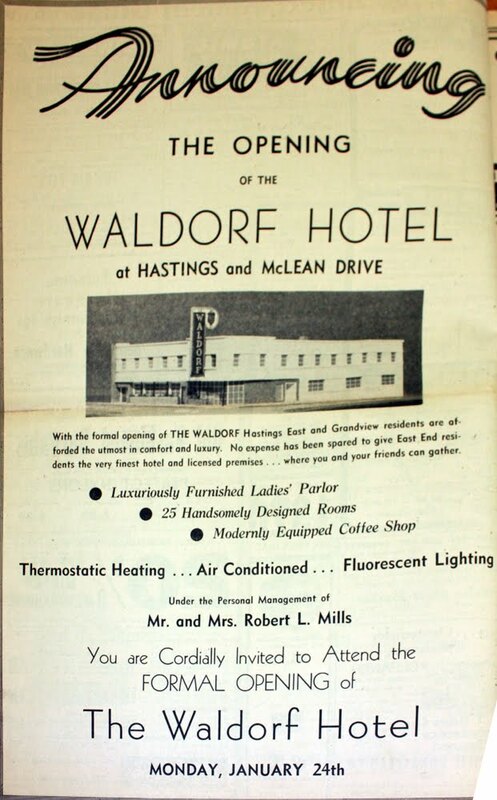 The Waldorf Hotel on East Hastings has recently been spruced up and thoroughly renovated. 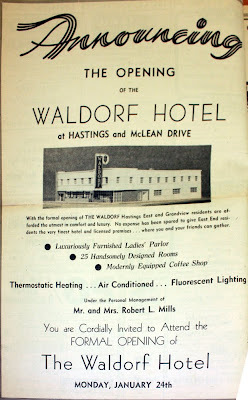 The work has been completed in time to celebrate the Hotel’s 63rd birthday today. At our regular meeting last night, Andrew Pask who is heading up the upcoming Community Plan for Grandview-Woodland, gave a presentation on the process. He then listened as we bombarded him with ideas for heritage issues that need to be front and centre in community planning for our neighbourhood. He took a lot of notes and seemed to be sympathetic to many of our concerns. It was good to have representatives from Heritage Vancouver sitting in on the meeting and adding their useful comments and suggestions. The Community Plan is still in its preparatory phase prior to an official launch later this spring. 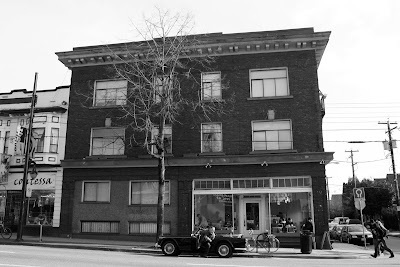 Jak King, one of our core members, is giving a presentation about Commercial Drive at the Museum of Vancouver, NEXT Thurs, January 26th, 7:30, in honour of the launching of his new book, an encyclopedia of The Drive. The Jeffs’ house has now been stripped and is just about ready for its journey. After some more internal bracing and some excavation work out in front of the house, the movers will come and move it. The move is tentatively scheduled for the week of January 23rd. We will be meeting at Britannia, in the Board Room in the Info Centre, 7:00, next Thursday, January 19th! Please join us! In August 1911, T.A. 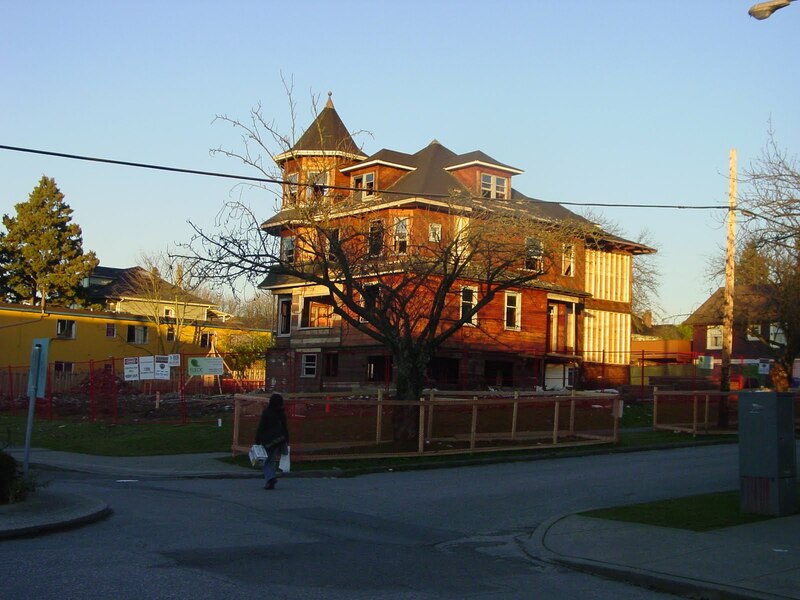 Allan and his brother received a building permit to erect a three-storey brick apartment building on the corner of Commercial & Fourth Avenue. In the previous two years, the Allan Brothers had erected large buildings at 1872 Barclay, 1460 Bute, 1860 Comox and 3216 E. First. 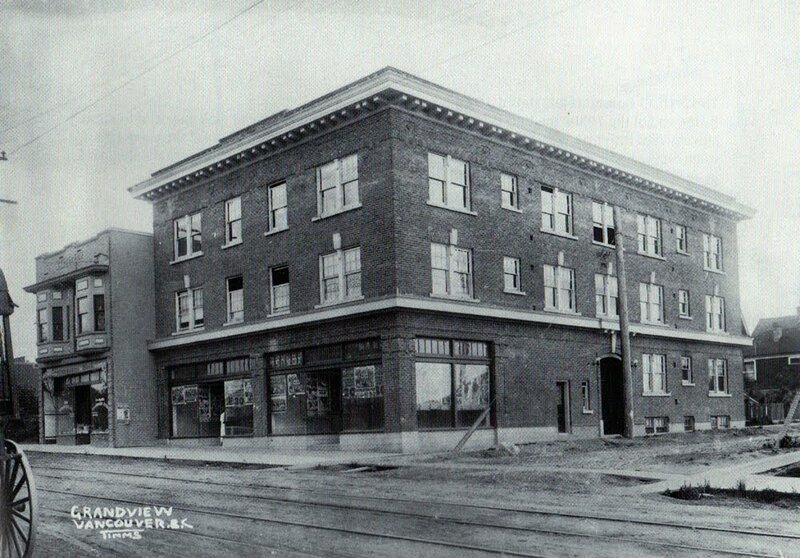 By the spring of 1912, the building on Commercial, then known as the Allan Block, was ready for occupation. In this image (VPL 7418) note the condition of the unpaved 4th Avenue. The building included 1932-1938 Commercial and apartments at 1707 E. 4th. The building was called the Allan Block until 1921 when, for reasons I have yet to pin down, it became the Henderson Block. However, it was once again the Allan Block between 1924 and 1928. In the latter year it was called Highland Block which is what is known as today. As the image above shows, the building was designed with two storefronts on Commercial. The storefront at 1932 had a hard time finding tenants who lasted more than a year of so. Mrs. Flora Murray’s dry goods store was the first tenant but she was swiftly followed by electricians, a fish store, a meat market, several music stores, a couple of beauty parlors and an upholstery dealer. The storefront has not been used for retail since 1943. The corner storefront had better luck. A series of real estate agents were the first tenants and they lasted until the mid-1920s. In 1930 Cut Rate Cleaners opened and the store remained a dry clearers (under the names Cut Rate, Uneeda, Steve’s) until the mid-1970s. Later, there were furniture stores and the return of a real estate agent. However, the store has been used by a series of cafes since 1998. The Highland Apartments have always been very popular and “The Encyclopedia of Commercial Drive” lists 497 residents from 1912 to 1999. This image from 2011 shows the building with Prado Cafe on the corner. We’ve run into a number of surprises, particularly in the basement, as we stripped out the old walls and the ceilings, including the supporting post that doesn’t and the rather precarious crumbling fieldstone foundation (or whatever is left of it) under the main supporting post at the front of the house. Sort of looks like something that Fred Flintstone would have built. It never ceases to amaze me how much abuse these old houses can take and still remain standing, even though by all rights it should have fallen down years ago. Suffice it to say our structural engineer was horrified. Actually posted by James Evans. Work progresses on the Jeffs’ house. The house was shorn of its stucco cocoon that it’s been wearing since about 1955, revealing much of the original siding underneath. The addition at the northeast and northwest corners of the house which were added probably in the 1930s have also been removed in preparation for raising and moving the house, which we expect to take place in about two weeks.